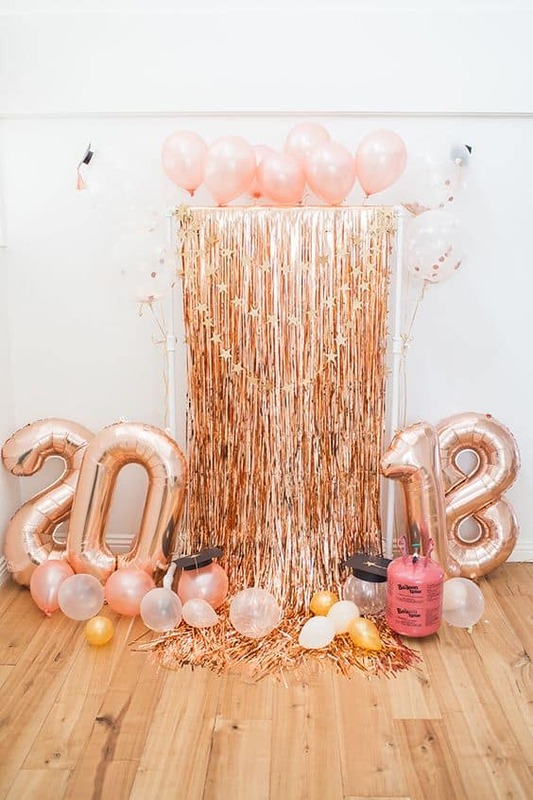 This post is all about graduation party ideas for 2019. 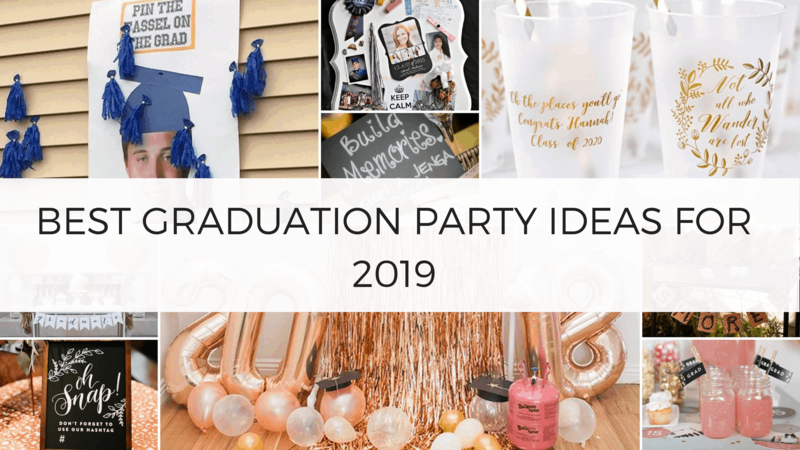 Can you believe it's already time to think about graduation party ideas for 2019?! 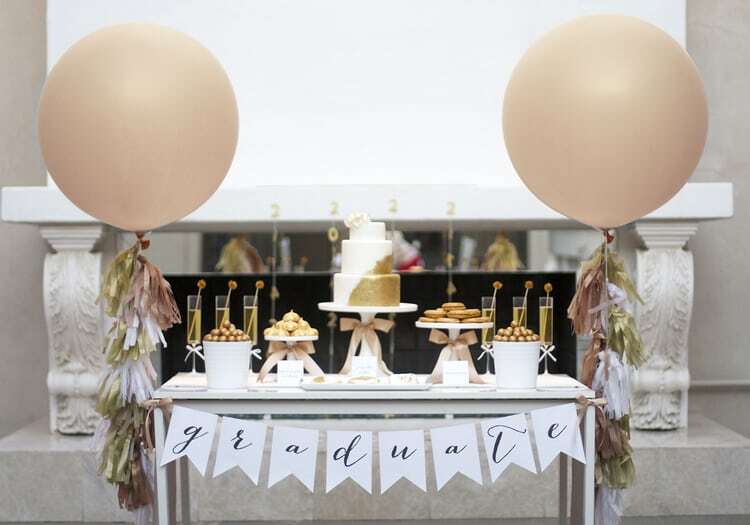 A graduation party is a big deal and with so many happening, it can be super overwhelming thinking about how you can make your party stick out from other peoples. I remember when I threw my graduation party, I searched Pinterest up and down trying to find the cutest ideas and honestly...I had SUCH a hard time. Everything looked tacky to me or thrown together last minute. 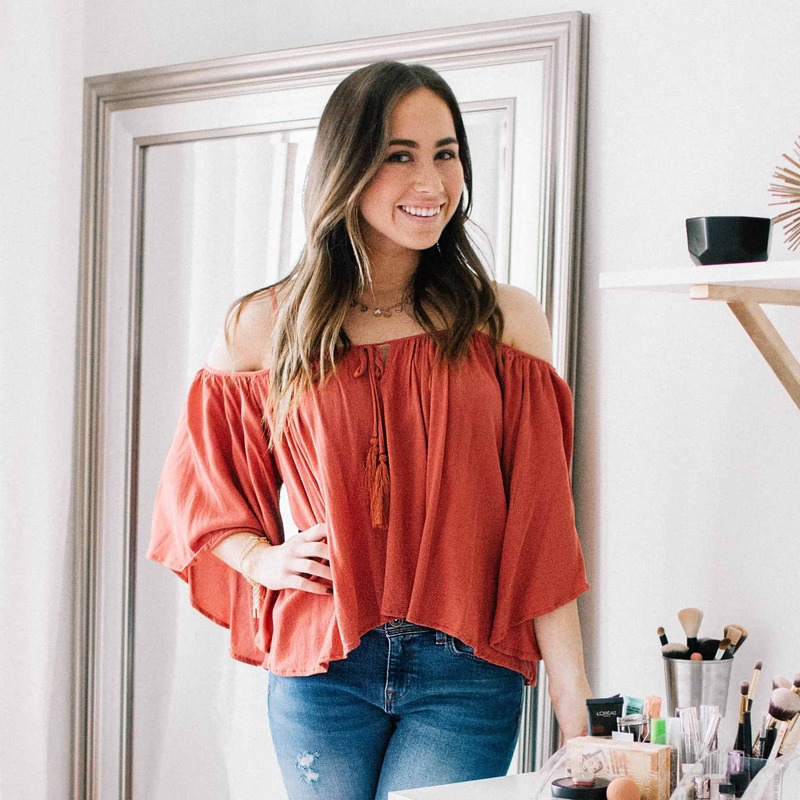 Luckily for you, I've been able to round up the cutest graduation party ideas that you can get inspiration from for your own party. This post shows you the best graduation party ideas for 2019. 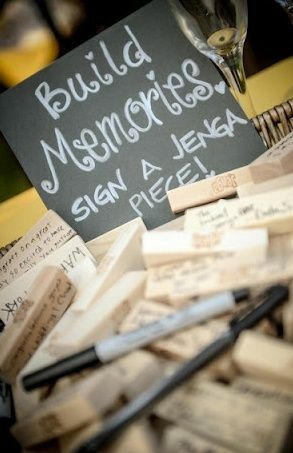 This is such a special idea that can serve as a reminder for all your memories years after graduation. We also love how budget friendly this is...you can buy a Jenga set for less than $10 dollars on Amazon. 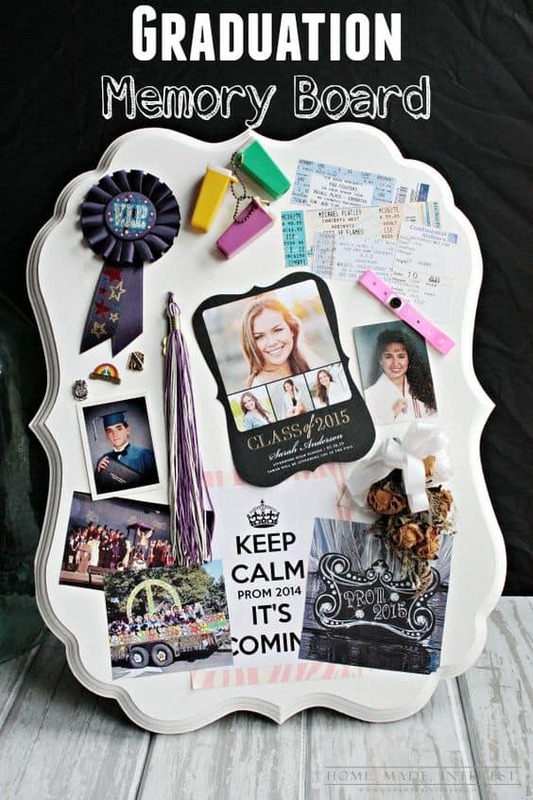 Having a photo area is a must for graduation parties and we love how easy it is to recreate this one! Is it really a graduation party if there aren't large balloons with the year you graduate?! They are so popular that they are now offered in all different colors. For graduation parties, the most popular is gold, black, rose gold, and white (our personal favorite --not seen a lot!). 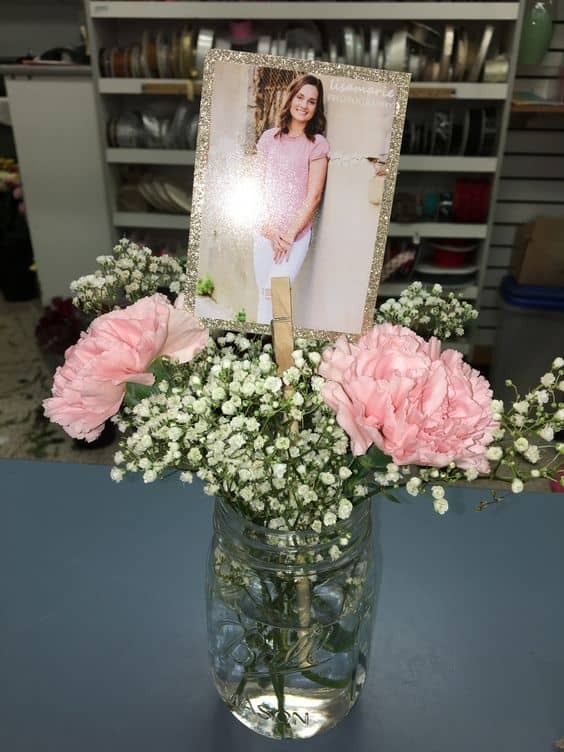 Mason Jar centerpieces are the perfect graduation center piece idea because they are so easy to DIY and customize to your liking. Not only is this really easy to make, but you can also customize it with your school colors to make it more personal. When it comes to simple graduation party ideas this takes the cake... well, cupcake ;). Creating a table of cupcakes is an adorable way to sweeten up any party. 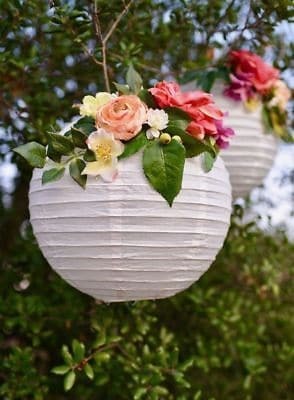 Lanterns are the perfect graduation party idea on a budget, for any backyard party, or even venue party. 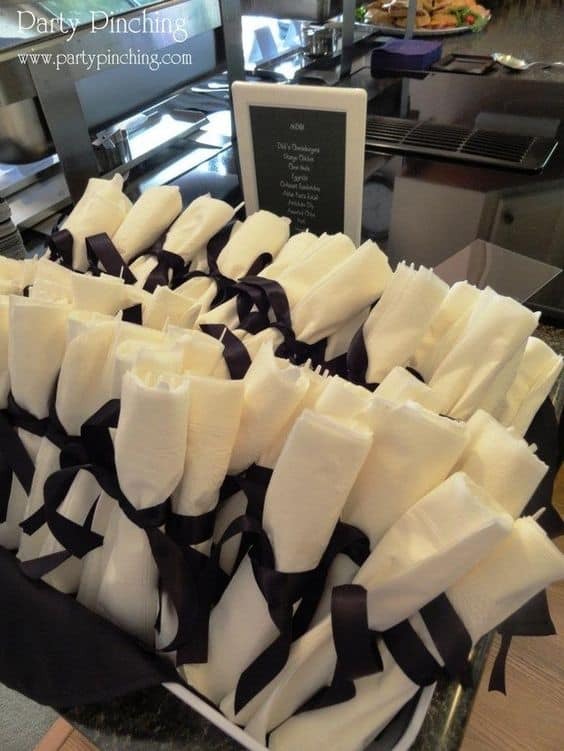 They are such a beautiful way to add a bit of classiness to your 2019 graduation party! We all know we look forward to the food at any event. A smores bar is the perfect delicious surprise everyone will love! 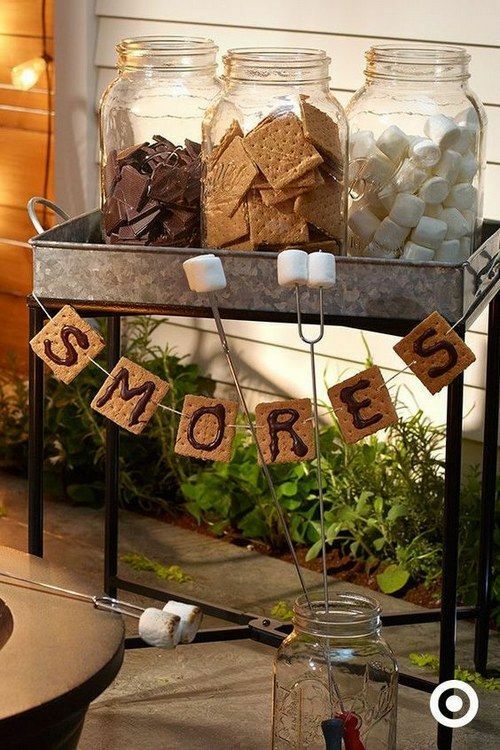 For your 2019 Grad Party Smores will be the most original idea while satisfying your guests sweet tooth. 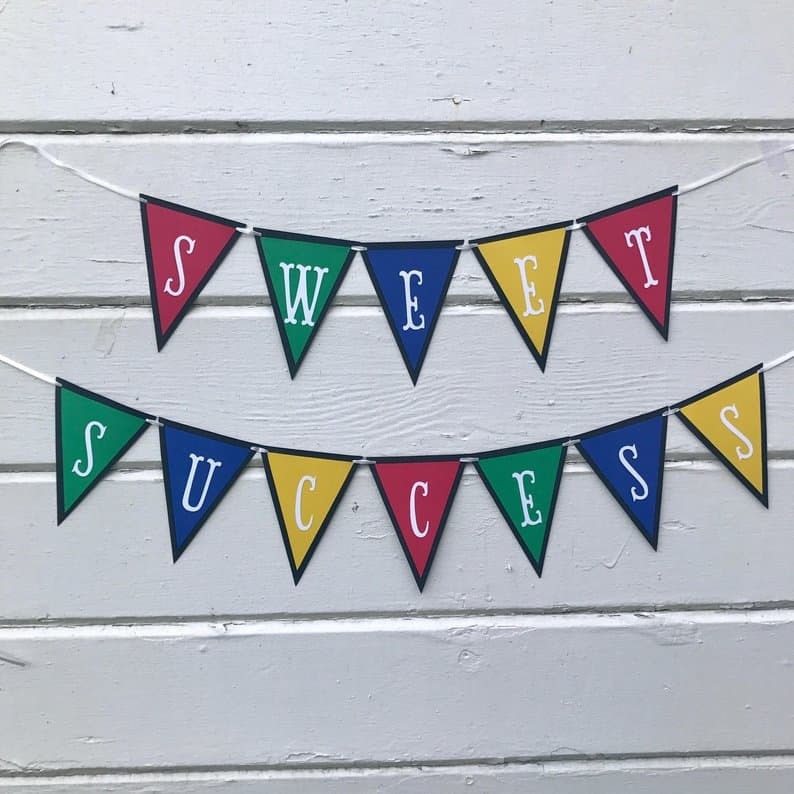 For 2019 graduation party supplies, these adorable napkins are the perfect way to bring out the grad party theme while using something with supplies from around your house. Call me an old soul, but I love looking back at memories and this is the perfect way to remember how you got to where you are now. 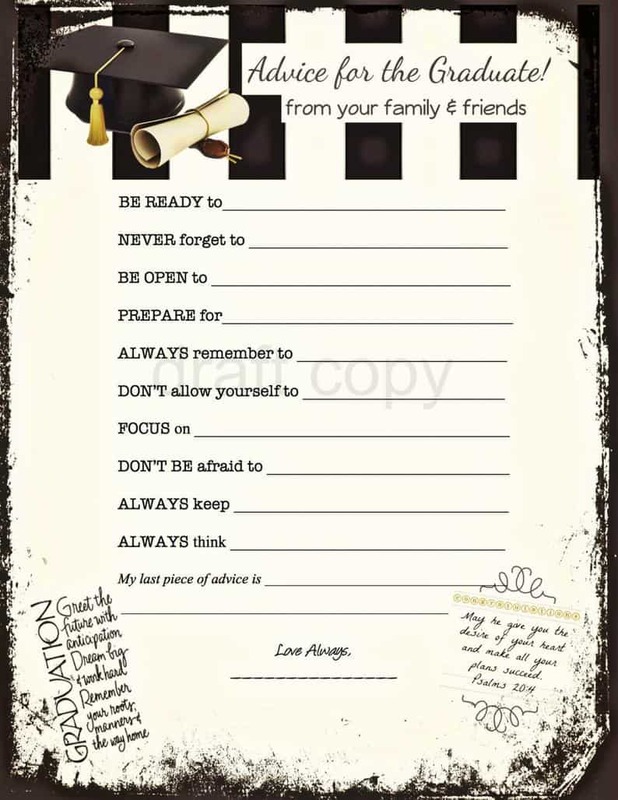 Being able to have your friends and family write kind words of wisdom is the sweetest 2019 grad party idea and such a great thing to keep long after the party! 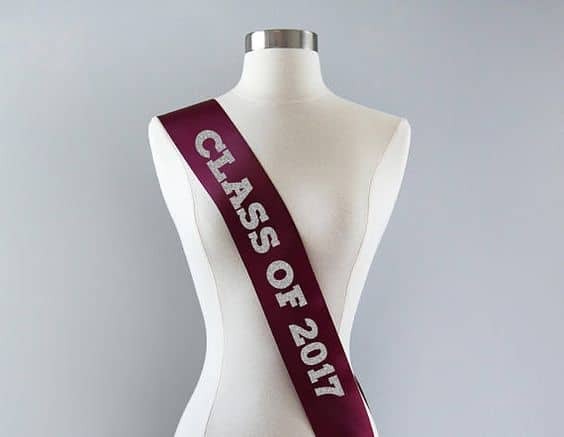 Adding sashes to any occasion is a super cute but easy way to make the graduate feel like the star of the show, because it really is all about them! PS! These sashes are super cheap so grabbing a few would be a cute idea for the photo booth! 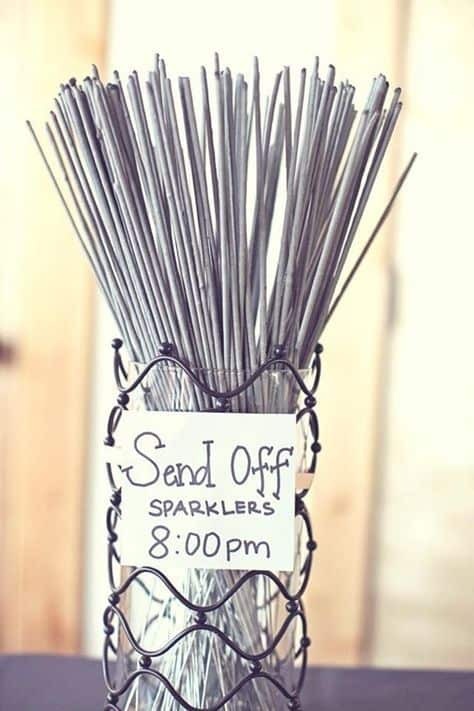 Did you know send off sparklers are on the top 20 Graduation Idea's List? These are the best way to send off any graduate to their upcoming future. 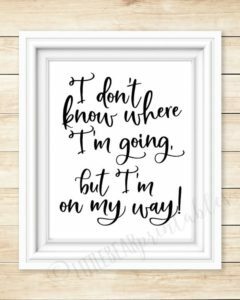 What a fun way to get excited for wherever you are headed next! Having a graduation theme is the way to go for any 2019 grad party. This black and gold graduation party theme is a classic and something that all guests will appreciate. Adding black and gold touches throughout the graduation party will help the theme come alive. 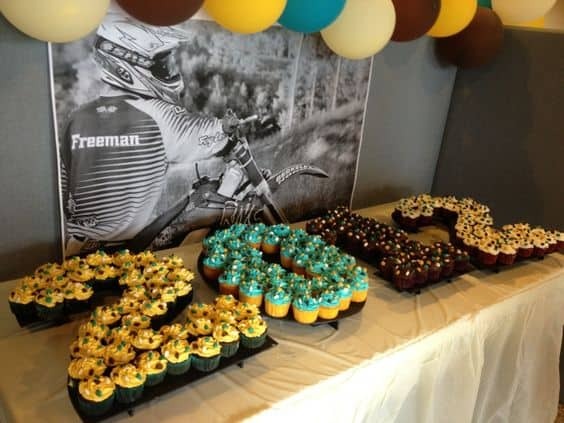 Simple signs and cookies can easily help transform your event. If you are looking for a graduation party idea on a budget, this is your you! 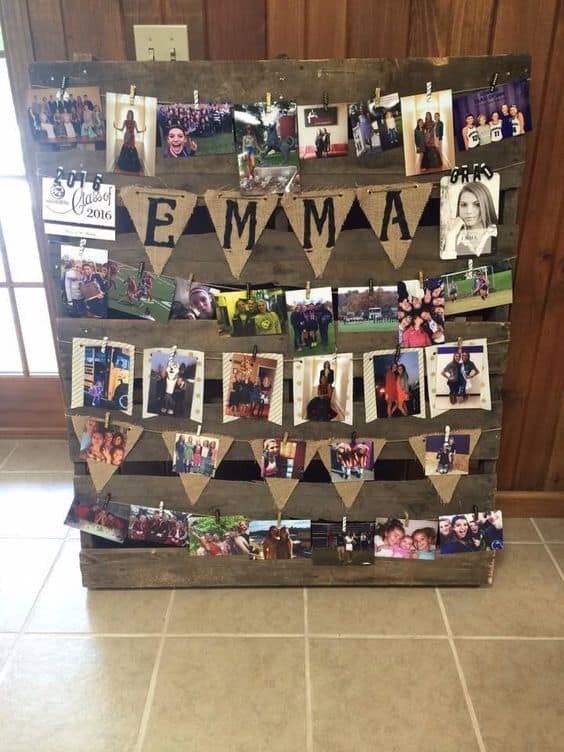 A photo display with memories from high school is the perfect way to add a special touch to your party. 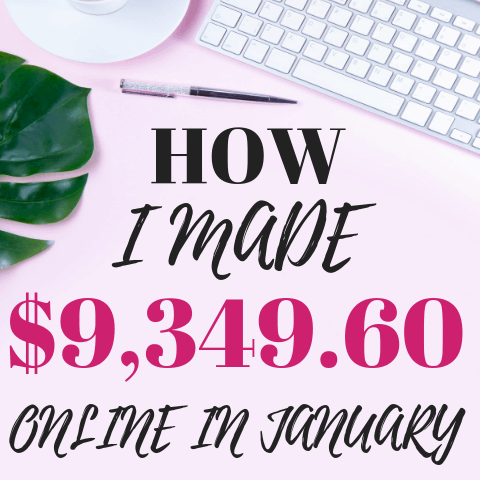 This can easily be DIY'd and cost you less than $10. I don't know about you, but I love tacos. Tacos are the perfect way to feed your guests on a budget, and focus more so on the decorations. 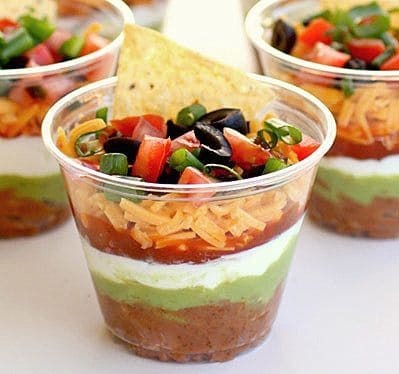 It is super easy to create taco cups of many different variations, or have your guests choose what goes into their own. So many of my friends did a taco food idea for their parties because it is quick, simple, and budget friendly. 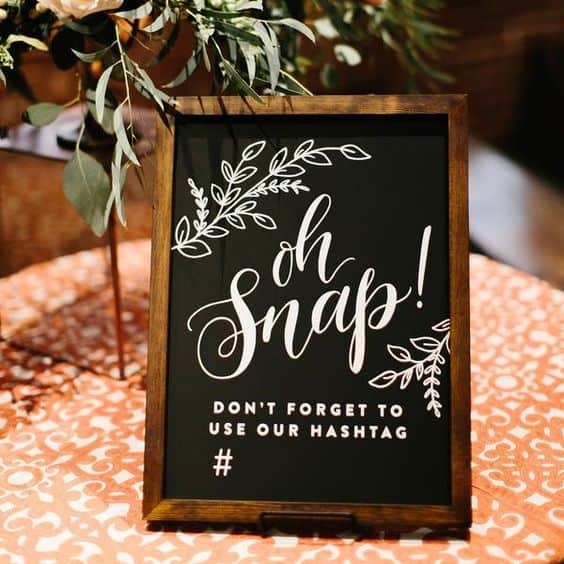 Creating your own hashtag is perfect for a 2019 grad party, and will have all your guests smiling for the camera. There are so many ways to personalize a graduation party including your own hashtag or Snapchat filter. 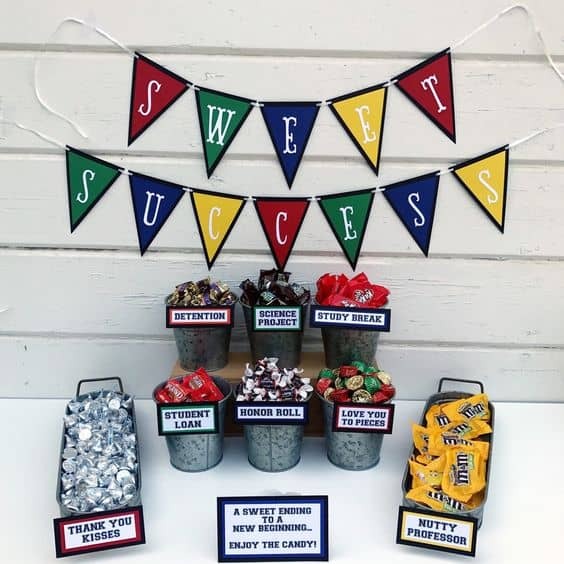 Graduation Banners are super simple graduation party ideas. I love how they add so much to a space and can be completely customized to your liking. A banner is also a great way to let your guests know that they are at the right place! Okay, how cool is this?! Let's be real, all the graduate really cares about is the $$$. 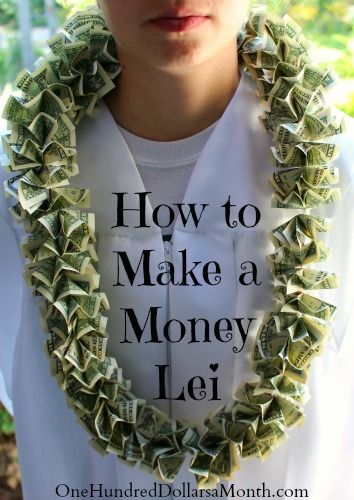 You can find a tutorial on how to make this lei here. We could all use some words of wisdom no matter how old we are and this is the perfect way to do so. Adding this fun activity into your 2019 grad party will be a great idea to hear others best life tips. When I hear party, I think games. Growing up whenever I would have a party I always had games or activities to make sure the guests always had something to do. 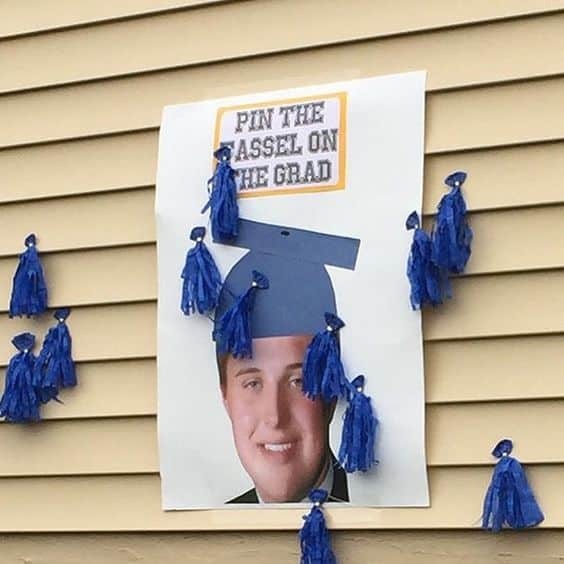 Pin the tassel on the grad is so cute and easy entertainment!! Is this not so beautiful?! This is the perfect way to dress up a dessert table. I loved this part of planning my graduation party. I wanted my snacks and desserts to scream graduation! Luckily this is super easy to do, as well as a budget friendly grad party idea. 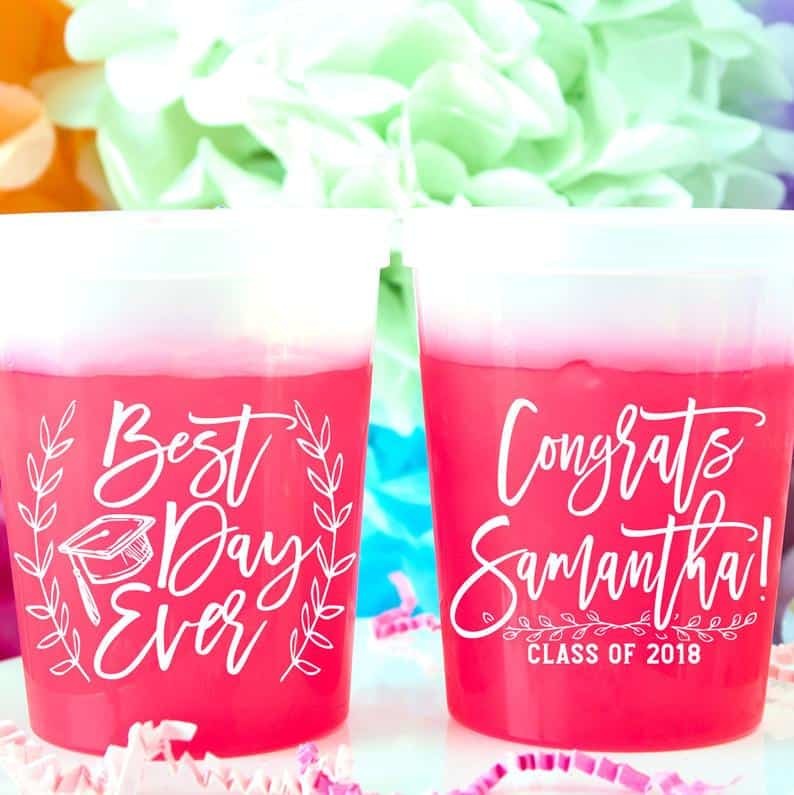 Personalized touches are always a great idea when it comes to graduation party ideas for 2019! 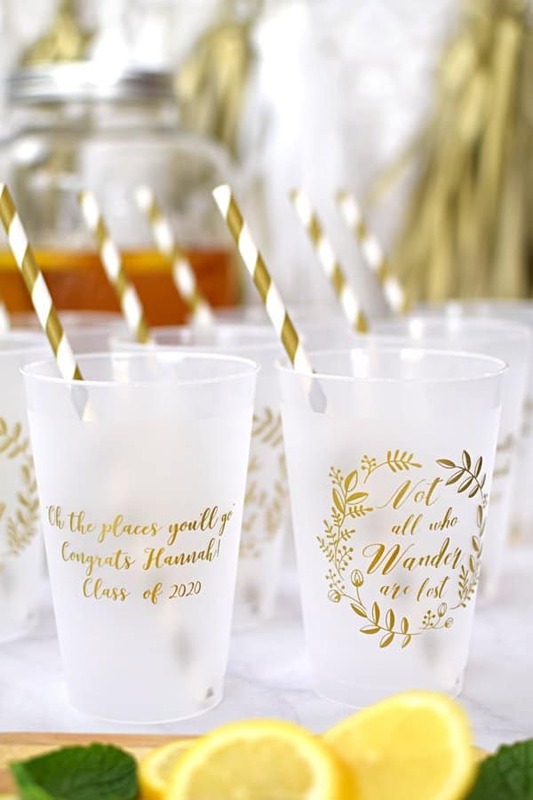 These cups are so cute and a great way to add that perfect extra touch to the party. Let's be honest, graduation party invites are everything. Invites excite the guests and if you have a family like mine they also serve as keepsakes. 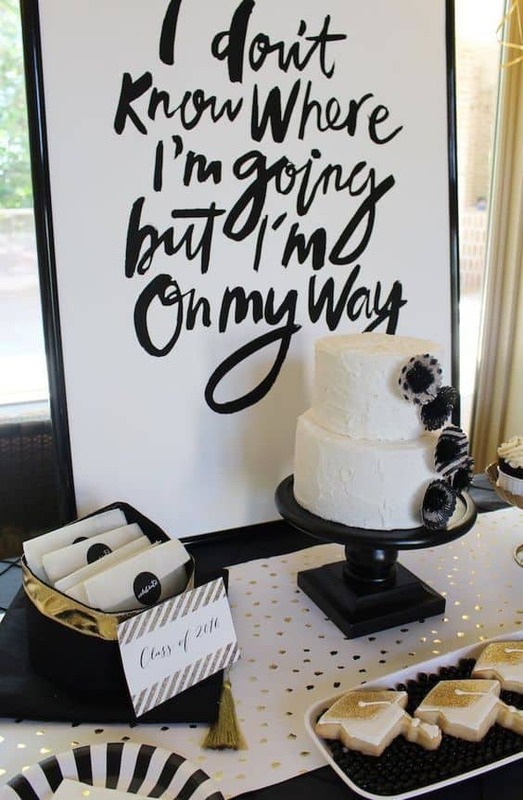 Luckily there are some amazing invites that are perfect while on a budget! 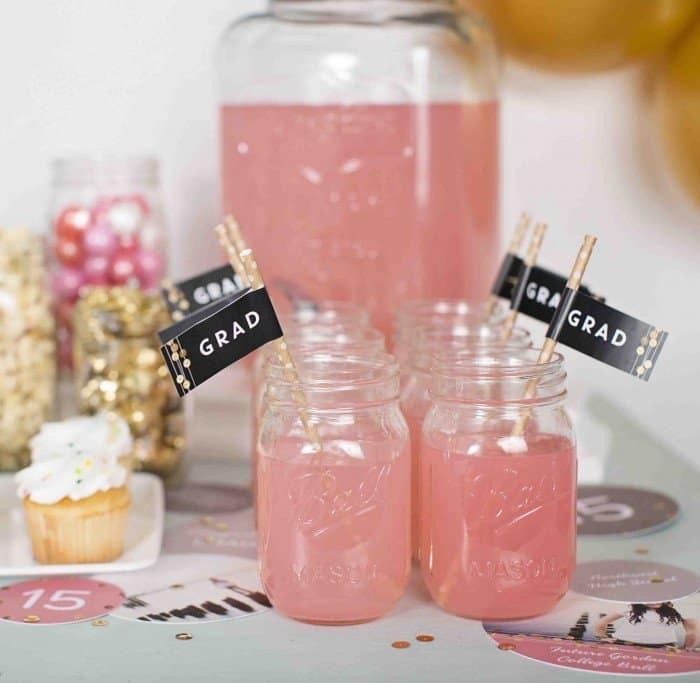 Serving cute drinks in mason jars with grad flags is a hot grad party idea this year. If you're looking for simple graduation party ideas this is for you. You can either serve mock-tails, or even simple lemonade with cute grad straws! This post showed you the best graduation party ideas for 2019.